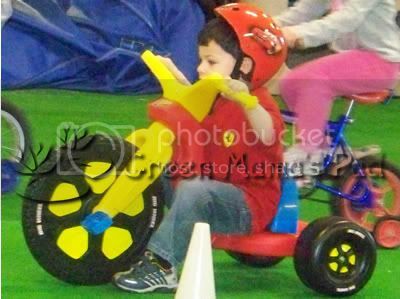 This past week at William's preschool the children participated in the St. Jude's Trike-A-Thon. 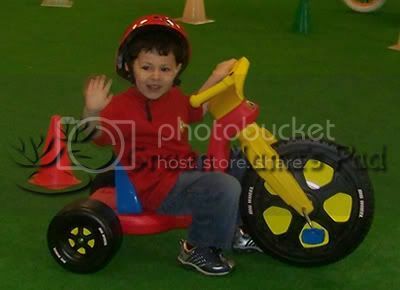 Trike-A-Thon is a fun, week-long curriculum and fundraising program for daycare centers or pre-schools that teaches children riding-toy safety lessons through a series of interactive stories. Children receive these lessons from special St. Jude friends, Bikewell Bear® and Pedals the Bunny™, while raising money for St. Jude Children’s Research Hospital. At the end of the Trike-A-Thon week, students bring their trikes or riding-toys to school and practice the safety lessons they have learned. Due to the yucky, rainy weather, the Trike-A-Thon was held inside, which was probably better anyway since it contains the children. I brought his Big Wheel and his helmet and he had so much fund riding around with his classmates. He refused to use the peddles, so instead used his feet to scoot around. All the kids were adorable and had a lot of fun. Here are a few pictures of my little man. I thought the Ferrari shirt was appropriate. As you can see I am horrible with a camera. William (mommy) raised $45 for St. Jude Children's Research Hospital. Its not a lot, but every little bit helps right? Love the idea of a Trike-A-Thon! And he looks so proud on his trike!! What a cutie!